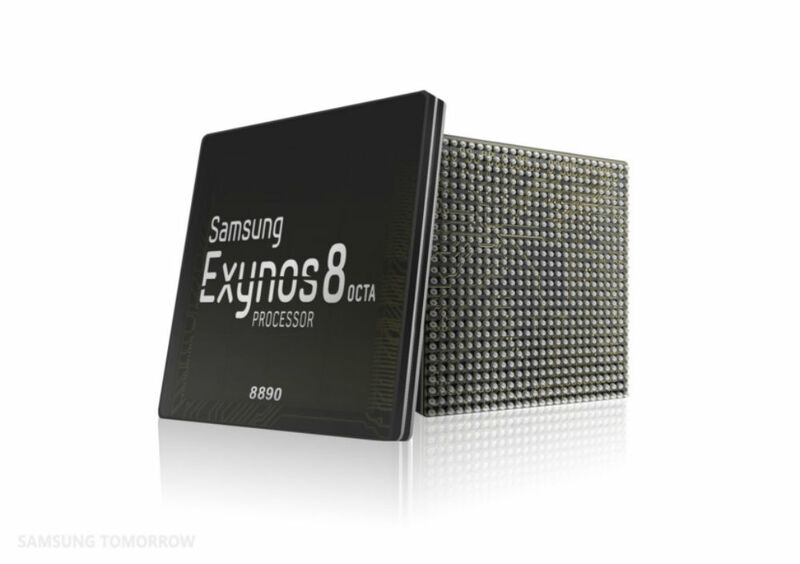 Today, Samsung introduced the Exynos 8 Octa 8890 application processor, the second processor from Samsung to be built on 14nm FinFET process technology. According to Samsung, unlike the previous Exynos 7 Octa 7420, the Exynos 8 Octa is an integrated one-chip solution that features Samsung’s first custom designed CPU based on 64-bit ARMv8 architecture, in addition to the latest LTE Rel.12 Cat.12/13 modem. For a bit more comparison, Samsung claims that the Exynos 8 Octa is capable of 30% better performance and has a 10% increase in power efficiency over the Exynos 7 Octa. The chip also supports enhanced “heterogeneous multi-processing” for efficient usage of all eight cores, four custom and four ARM Cortex-A53, to deliver the high performance and power efficiency. The Exynos 8 Octa employs ARM’s latest GPU, the Mali-T880. The Exynos 8 Octa is also an integrated single chip solution that combines the application processor and modem. The Exynos 8 Octa integrates an advanced LTE Rel.12 Cat.12/13 modem that enables a maximum download speed of up to 600Mbps (Cat.12) and upload speed of up to 150Mbps (Cat.13) with carrier aggregation. Thanks to the integration, hardly any space is needed for this hardware, allowing OEMs, such as Samsung itself, to focus on more thin, or even more unique designs for consumers. Samsung announced that it plans to begin mass production of the Exynos 8 Octa in late 2015, which means, we might see this processor in the possibly upcoming Galaxy S7.